As you look and read through the pages of the 1983 Schwinn BMX bicycle catalog you'll probably notice that a alot has changed at Schwinn. It started with this catalog, which was conceived, planned and designed strictly for the BMX rider. Each 1983 model is clearly identified as to its intended use and each component is described in detail, by model, in the Specification Chart on the last two pages. The chart will help you to determine the model bicycle which best meets your needs and expectations. Also new is the Predator concept... now identifying every Schwinn BMX bicycle that is made of chrome-moly tubing. When you see or hear Predator you are assured that the bicycle frame is built interely of 4130 Chrome-Moly steel tubing. The most exciting aspect of the 1983 Schwinn BMX program is the bicycles themselves. Never before have features such as 4130 chrome-moly steel tubing, aluminum alloy rims, rattrap pedals with chrome-moly steel axles and gumwall tires been available at such affordable prices. These features make every 1983 BMX model a potential winner, whether you decide to compete at the local BMX track or just race your friends on the way home from school. Product development starts with Schwinn factory riders. The Schwinn factory R & D (research and development) BMX racing team is an elite group of BMX riders carefully selected to represent Schwinn on and off the track. In their individual classes they represent the most knowledgeable, experienced riders in the country. The Factory R & D team not only represents Schwinn they also represent you the Schwinn customet. Schwinn riders are continually asked to test new parts to find out if they will stand up to the stress competition. If it turns out that the part being tested is more "show than go" it doesn't get on a Schwinn bicycle. So, when you finally decide which Schwinn BMX bicycle is best suited to your needs and expectations you can ride it with confidence, knowing the Schwinn Factory R & D team has helped you pick a winner! Schwinn has taken great care to assure that all of its 1983 BMX bicycles and All-Terrain bicycles are designed and manufactured to withstand the normal stress which occurs in competition and off-road riding. Components, for example, are selected for use only after they have been tired in competition and survived. Frames are subjected to the most rigorous testing before they are approved for production. Strict quality control applies throughout production and assembly of Schwinn bicycles to minimize the posibility of defective parts. Despite all of our efforts, a Schwinn BMX or All-Terrain bicycke can break. In those rare instances when a failure is due to a defective part you depend on the No-time-limit Schwinn limited warranty and the service of your authorize Schwinn dealer. Most failures, however, occur when the bicycle is stressed beyond design limitations, such as falling or during crash. Even though such failures are accidentes and may not be the fault of the rider, the responsibility for repair must be assumed by the rider. Following the rules of the road when riding on the street and using reasonable care when practicing or competing will minimize chances of accident and avoidable repairs. Schwinn will replace any defective part. No time limit. No charge - except for dealer labor after 30 days, or after a year in case of defective frames. See your Authorized Schwinn Dealer. Pro from start to finish. Superior performance and durability in a compeition - proven design. Combines the ultimate in high - performance components built around Schwinn's patented tri - oval lightweight frame which maximizes strength - to - weight frame which maximizes strength-to-weight ration. Space age chrome-moly double butted tubing for on-track competition and hard training. See the complete history of the Schwinn Sting. The name says it all. Engineering advances in the exclusive bi-oval lightweight frame fabricated throughout with built-to-take it 4130 chrome-moly lightweight tubing. God looks to match, including the Surgino Super Maxy lightweight aluminum alloy crank with chrome moly spindle. No ordinary cruiser, but a competition equipped 24" wheel bike featuring full 4130 chrome-moly tubing; light, but strong. Lookin' good, too, with features you wouldn't expect at the price. Another Schwinn Predator with strong responsive 4130 chrome - moly tubing at the heart of the Schwinn frame. Dia-Compe MX900 brakes for sure stops and a choice of Araya 7x aluminum alloy rims or the built-to-take-it ACS Z rims. Both offer high traction, good looking tires. Sweet, smooth and sassy on-track and off. Turns heads with the competition designed freewheel CR MO MAG, a genuine Predator by Schwinn. Designed to provide rough riding dependability with a chrome-moly double gusset frame and features to spare. Available in show chrome with red or black trim. You want all the advantages of the CR MO MAG, but with the sureness of coaster braking power for off-track riding. Here it is. Just like the competition CR MO MAG, but equipped with sure stop coaster brake. And they're all PREDATORS... only from Schwinn. Designed with performance in mind, this Predator is equipped just like the CR MO MAG with freewheel, except with spoke wheels instead of mags. Priced like a street bike with all the features of a competition bike. For the young BMX rider, top-of-the-line features, but with a scaled down frame and 16" wheels. Built with tomorrow's champions in mind, or for any BMX rider that wants to cruise the "pits" at races. Making every day different is what Schwinn Thrasher is all about. An exciting new look in a MAG wheel coaster brake bicycle designed and engineered as only Schwinn can. Available in red or black with gold trim. A competition price the competition can't beat. And it's a Schwinn! Super looks and style and the spirit of BMX. Just like its companion model, the Thrasher Free sports all of the same features with freewheel gear and handbrakes added. 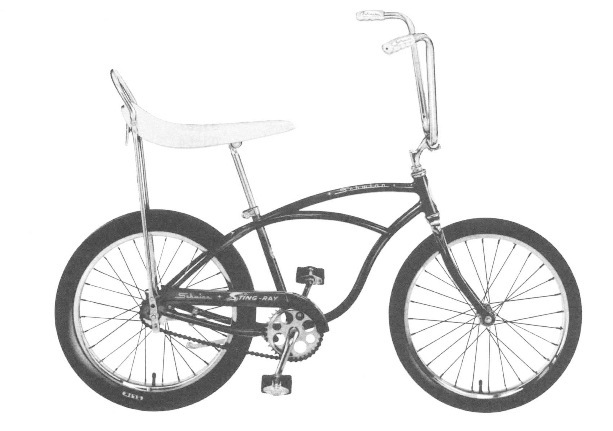 Schwinn engineers designed this scaled down version of the Thrasher for younger riders. The Mini Thrasher is a durable, easy-to-ride street bike in the classic BMX mold. Engineered with durability, value and the younger rider in mind. The Manta-Ray features an assortment of quality BMX components, but offers the comfort and convenience of traditional bikes for youngsters. Quality rattrap pedals and Carlisle Aggressor tires for maximum traction.